We've mentioned Microsoft's Xbox video camera before; the news we'd gotten at E3 suggested that it wouldn't see the light of day until the holiday season, but we're now getting news that it should arrive for both North America and Europe on September 19th. 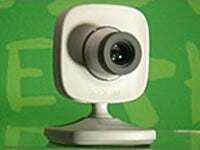 The Xbox Live Vision camera, as it has been officially deemed, lets gamers send photo messages, add a picture to their gamertag, and chat via Xbox Live. In addition, it will be supported in some of the online games in the Xbox Live Arcade, like Uno and Texas Hold 'Em Poker. The camera's internals are being constructed by a company called GestureTek, and no pricetag has been dropped yet. Man, there's nothing better than seeing the look on your opponent's face when you deal that devastating Wild Draw Four in their direction. Expect some serious tears of agony.